Star Micronics presents PassPRNT, its printing application for iPad®, iPhone®, iPod Touch®, and Android™ devices, and compatible with Star Bluetooth printers. 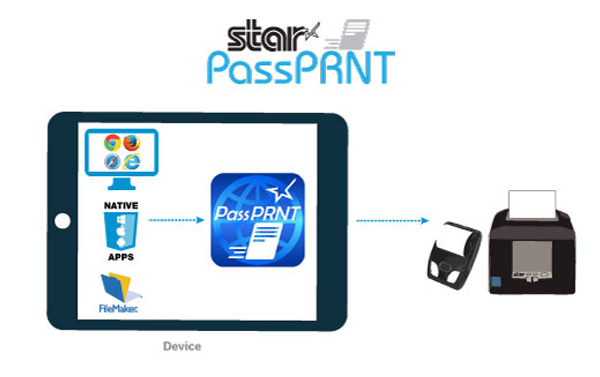 Always leading - always innovating, Star's PassPRNT app receives print data from native and web-based applications using a URL scheme and sends it to the Star Micronics Bluetooth enabled printer. Star's PassPRNT supported printers currently include the SM-L200, SM-S230i, SM-T300i, SM-T400i, TSP650IIBTi, TSP700II BTi Label, TSP800II BTi, and mPOP™. For the first time, PassPRNT links with Star's POS and portable printers to enable printing using Star's unique URL scheme based printing method, and the PassPRNT companion app. Its easy-to-use integration allows users to print from any FileMaker Go™ project, native, or web-based application. With the operating system capable of automatically switching from a hose application to the PassPRNT application, a simple and user friendly "one-tap" request to print from any iPad®, iPhone®, iPod Touch®, or Android™ device to a Star Bluetooth printer is now possible. Star Micronics PassPRNT is now available on the App Store and Google Play. Functions PassPRNT is called by the host application using a URL scheme, accepts the printing data, and then prints it to a Star Micronics-brand Bluetooth printer. Printer Settings Settings can be made from the PassPRNT settings screen, or settings can be configured using queries from the host application. Data Specifications Application interaction using a URL scheme follows the iOS standard URL scheme (including path and query). Using this method allows data to be accepted from the host application.